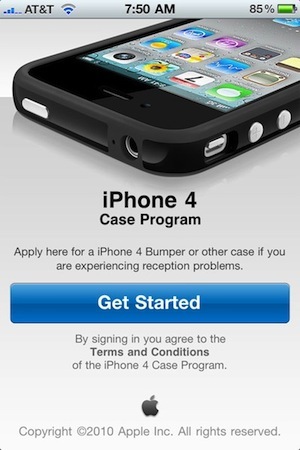 Apple just started its free iPhone 4 Case Program that allows all iPhone 4 users to receive a free bumper or case in order to help fix the device’s well reported antenna/reception issues. 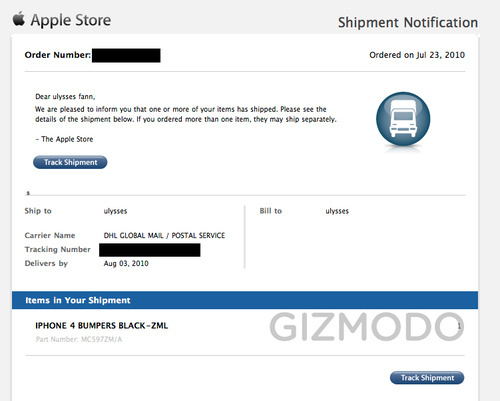 While there was some speculation on how long it would take to actually get the cases shipped, it appears now that iPhone 4 owners are confirming many case orders have begun to ship (image above). If you are an iPhone 4 user interested in getting a free bumper or case from Apple and haven’t started the process, you can do so by downloading the iPhone 4 Case Program app from the App Store. 1. Download the iPhone 4 Case Program app from the App Store. 2. Launch the app on your iPhone 4 and sign in using your iTunes Store account or Apple ID. 3. Select your Bumper or case. For iPhone 4 purchases made before July 23, 2010, you must apply no later than August 22, 2010; otherwise, you must apply within 30 days of your iPhone 4 purchase. To qualify for this program, you must purchase your iPhone 4 by September 30, 2010.